There are some variations which, while popular at club level, rarely get an outing at the top. 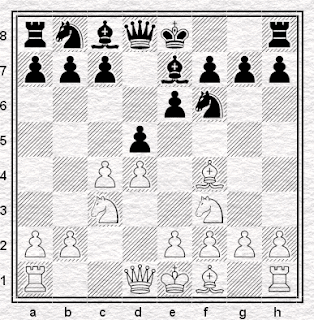 One obvious example would be the Colle, perhaps no longer a serious try for advantage at grandmaster level but a solid - very solid - points-scorer lower down the food chain. Then there's the variety of anti-Sicilians, which while not absent from the elite tournaments are rather more rare than 2.Nf3 and 3.d4, save that period a few years ago when everybody started messing about with 1.e4 c5 2.Nf3 Nc6 3.Nc3 e5 (which isn't really what I'd think of as an anti-Sicilian anyway). The scrappers, by contrast, are more likely to see 2.c3 or a Morra than a main line. Similarly, I know from some experience as a Lopez practioner that if White is stronger than I am, 1.e4 e5 will lead to a main line Lopez more often than not - but if they're weaker, it's a big surprise if we get as far as 5.O-O without some deviation. This is odd, in a way, since it's an established phenomenon that top players tend to set the fashion in openings, not only for other grandmasters, but for chessplayers in general. Nothing else can explain the interest that players who can barely remember the theory beyond move five show in the Najdorf, as if the fact that Kasparov and Fischer played it must perforce mean that it is a deadly weapon in their hands. Well, an atom bomb would be a deadly weapon in my hands but I wouldn't actually like to touch one, and that goes for the Najdorf too. Anyway, if there are openings which are rather more popular at our level than at the level where the good players are, it must surely mean that the opposite is true. There are surely fewer Petroffs at our level than at the highest, possibly because the club player's repertoire is necessarily limited and you can't afford to spend time on an opening which gives White a draw when they might be forty ECF points worse than you. (Of course, if we stuck to our openings, you might learn a more combative opening very well and then add the Petroff to your repertoire. But we tend rather to change than add.) You also see rather fewer Semi-Slavs from club players than from supergrandmasters: mind you it'd be hard not to, as they're barely playing anything else in Mexico City. However, there's a couple of opening variations, frequently seen in grandmaster praxis, that I've seldom or never seen, in any club match I've played in or any tournament game I've seen, save for grandmasters on the high boards of a very strong open. Variations which, for one reason or another, are basically absent from the repertoires and the thoughts of club players. One of these is the Marshall Gambit in the Lopez, which is currently considered so sound that it is more often avoided by White than actually played by Black. Indeed, it's got to the point that I rarely recognise a grandmaster Lopez any more, since rather than use the order 7...d6 8.c3 O-O 9.h3 that I play and love, everybody goes 7...O-O then 8.a4 or 8.h3 Bb7 and we get into positions which are not quite the ones I know. and sometimes White wins quickly! 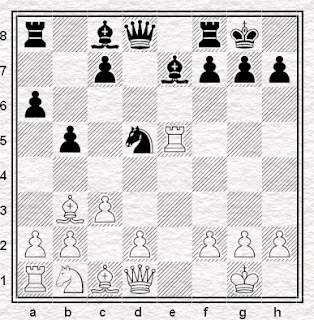 In fact it looks like a position offering decent and comprehensible play for a pawn, which indeed it does, very much the sort of thing that attracts club players to, say, the Benko Gambit. But, unlike that less-sound gambit, among club players it is rarely seen. Very rarely indeed. In fact, I'll go so far as to say that in my thirty-year experience I've seen it, to my recollection, precisely once. I remember that, because I was playing it, with the Black pieces. I got beaten convincingly. I didn't play it again, which might normally be considered an extreme reaction, but I think was fairly sound: you have to remember an enormous amount of theory to play it, theory which you will almost never get to play anyway. And if you do, it will be to little purpose because the only people to play down the main lines will be people who know them well themselves. 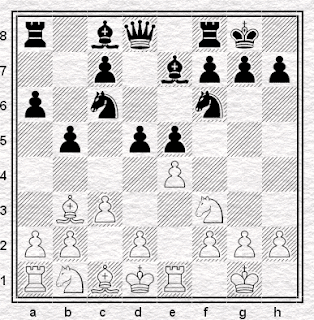 That's a big difference between club players and grandmasters, as regards the openings. They can and must assume that the opponent knows existing theory. They therefore look for novelties. We, however, seek only to know more than the opponent. Which is pointless, if they'll never let you show it. Or if you'll only get to play the theory when, in fact, you don't know more of it than they do. Added to that, the fact that the Marshall won't, in many lines, give you more than a draw, and you can see why it's rarely seen (though not, perhaps why quite so rarely). I once saw the estimable Tim Harding recommend it as an ideal choice for the club player, or a phrase similar to that. I thought that was completely wrong. I think it is the opposite. Maybe I've just been looking in the wrong direction, I dunno. But I've not seen it played. Never. Not once. I wonder why not? I'm not sure how often you see a good old fashioned QGD from black though, either... Not playing 1.d4 I'm not sure, but my hunch is whilst not as obscure as the Marshall at club levels, not at the same height of raging fashion that 2.c3 is v the Sicilian. I played this line - as Black - last year in the London League. I lost via a winning position as it happens. My opponent was clearly struggling to remember the theory but played into the sharp 0-0-0 lines anyway. After he'd castled long he immediately went out of book with a harmless variation from the mainline. He told me after the game nobody had played a regular QGD against him for a long time. My experience playing the QGD as Black is that most d4 players don't seem to face it very often. I've also found that e3 before developing the Bc1 are the most popular set ups. That's at my level of course - which is somewhat lower than yours Justin. Funnily enough I also play Bf4 set ups as White - though not since the end of the season before last. PS: I seem to remember the Marshall being quite popular at the end of the 80s/early 90s - back when you had a reasonable chance of White accepting it. the lack of popularity of the QGD at club level, as compared to say Nimzo/Queen's or Bogo Indian, as always mystified me. The main disadvantage of playing ...Nf6, ... e6 and something other than ... d5 seems obvious to my eyes - you have to learn TWO openings not one. I played the Marshall for about a month, learning the ins and outs. In about 20 Ruy games as black, white got to the point where I could play it...once. White deviated quite early. You played twenty games as Black in one month?